AOL UK will be the exclusive content supplier to TalkTalk's online consumer portal and serve ads using its ad tech platform. The companies have announced a new syndication deal in which AOL will now power the news and TV guide sections of talktalk.co.uk, with content from The Huffington Post as well as AOL’s news, travel and lifestyle sections. AOL, owned by Verizon, will also provide video and display advertising through its technology properties. The company has made a big push to strengthen its ad tech offering in recent months, with the planned acquisition of Millennial Media, announced last month. In June Microsoft awarded AOL the contract to sell its global display and mobile ad sales. Following that deal, AOL said its ads reach more than 75 per cent of the UK online population, with the TalkTalk deal adding approximately two million more unique views. The TalkTalk deal builds on a nine-year partnership with AOL, beginning in 2006 when TalkTalk bought AOL’s internet service provider business for £370 million. By syndicating AOL’s content, TalkTalk wants to grow its online audience and provide new advertising opportunities for brands and agencies. Hamish Nicklin, the managing director of AOL UK, said: "The combination of TalkTalk’s great subscription quad play business and AOL’s strengths in producing high quality, original content backed by a powerful advertising technology platform make this such an effective partnership. "It allows each partner to focus on their core strengths and together drive even greater consumer engagement and revenue." TalkTalk recently joined the Content Marketing Association to develop expertise in creating successful content marketing strategies. 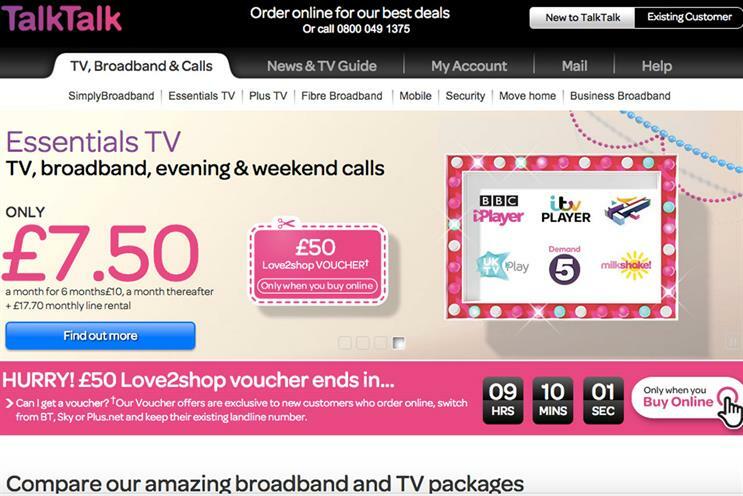 David Parslow, TalkTalk’s head of marketing, said: "Our popular News and TV Guide will offer a specially selected feast of the best content on the web from organisations like AOL, The Huffington Post, Buzzfeed, ITN and Channel 4, along with targeted advertising based on visitors’ interests delivered through AOL's ad platforms. "Additionally, this new partnership allows us to produce relevant, tailored content about our products and services in a way that deepens engagement with customers."